We cannot emphasize enough that this is a huge, empty box. The Bigger Blacker Box is a tremendous, empty storage case that can hold Cards Against Humanity and every expansion. Now redesigned to hold the entire expanded Cards Against Humanity product line! (60% more cards than before). 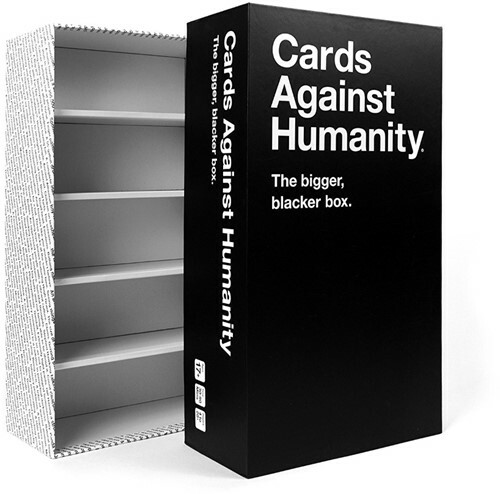 - The official, tremendous storage case for Cards Against Humanity. Holds up to 2,500 cards. - This is an empty box. It does not include a copy of Cards Against Humanity. - Includes 50 blank cards, the 20-card Box Expansion, and some special surprises. Who knows what's in there?